To add a classic look to the walls, Heydt designed custom wall paneling to complement the Victorian architecture of the home. 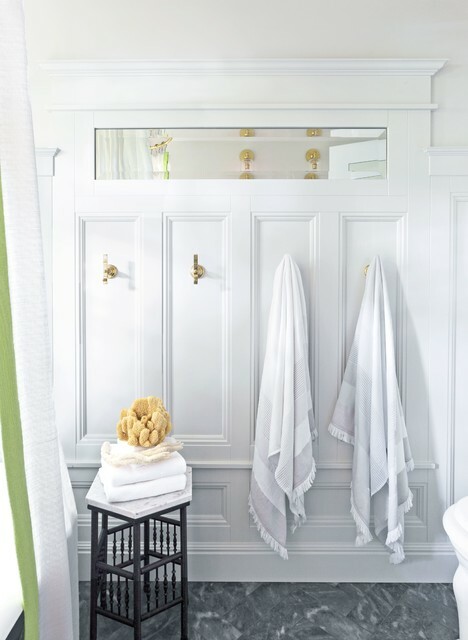 Here, the wall opposite the sink is evenly divided into four panels with a towel and robe hook for each child. The beveled mirror above complements the window transom and reflects more natural light into the bathroom. The homeowner found the antique hexagonal marble-topped table at a fair in Virginia. Exxcellent use of master bath wall space. And we should get one of those wall heaters for towels. Good idea for a blank wall, but to still make useful.